We have been working with various 3D print designs since we first acquired our first 3D printer in 2013. In the beginning, we printed simple shapes and one piece tools in order to learn the software and work with the materials. The 3D printer is slow, and it is a meticulous process to print any design. Now, we are able to use this printer to produce several usable prosthetic devices, the most recent of which is a prosthetic hand for a very young patient. This design was adjusted using software to create a plan for the first printing effort - with some estimations, since this is all a very new, custom design. We were seeking to find just the right size for the patient, which takes some creativity as well as trial and error. The first printing created a device with a palm size reduced from the original E-Nable model, and a modified cuff. After a fitting with the patient, changes where made for a second printing - the palm was slightly enlarged, and the cuff was redesigned. This is the version fit at the patient’s next appointment, shown below. In a separate effort, a few months prior to making this particular device, we created a new prosthesis for a growing young man that resembles a Batman gauntlet. His first 3D printed device was delivered in December of 2015 - and it was modeled after Iron Man’s gloved hand. We are continuing to test the limits of the current printer as we explore the ever expanding technology of 3D printing, with an eye toward acquiring an even better printer in the future. Especially if we can create smiles like this one! If you are interested in seeing a video we made as an introduction to 3D printing, and one that features our own Art Ross and some of our projects, just click on the video link below. Kristen Beltran and event organizer Kris Hanks. Art Ross, Kristen Beltran and Brad Sweet from the Lindale Middle School E-Nable program. One hundred students in grades 4-12 representing four Anne Arundel schools, and their community partners gathered together to complete their project on 3D printing of prosthetic hands. This Problem Based Learning project, focused on prostheses, wrapped up Saturday April 23, 2016 when students from the Anne Arundel schools gathered at North County High School in Glen Burnie, MD. The E-Nable Helping Hands Event allowed the Science, Technology, Engineering, and Mathematics (STEM) students to connect after their months long work on the project. 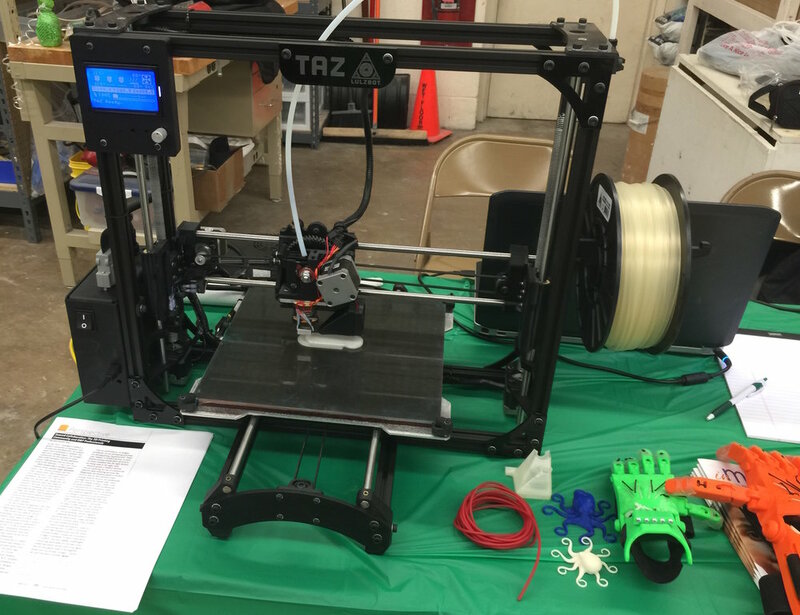 The Helping Hands event was designed to provide one hundred STEM students with an opportunity to work with new 3D printing technology, encourage “out of the box” thinking, and interact with community partners. During the school year, these students from grades 4-12 have focused on upper limb prostheses, particularly prosthetic hands. Class activities have included design and drawing of prosthetic hands for multiple active functions, writing a children’s book about prosthetic devices, and the 3D printing of prosthetic hands. Dankmeyer, Inc provided support at various levels, starting with hosting visiting students in the Linthicum office earlier in the spring. There students attended a presentation given by Kristen Beltran, Resident Prosthetist Orthotist, and toured the facility, with the opportunity to see a lamination and plastic drape molding in the lab. Kristen also went to schools with demonstrations of upper and lower limb devices. Saturday’s event included rotations to different areas showcasing the works of the various participant schools. One rotation included professionals at work - so Art Ross, Prosthetic & Orthotic Lab Technician, and Kristen joined the students at the event with a Dankmeyer display and presentation on prosthetic and orthotic clinical practice. They provided additional information on prostheses and orthoses, with demos of terminal devices that serve a variety of recreational and daily use purposes, such as golf, kayaking, basketball, eating, cooking, and using tools. 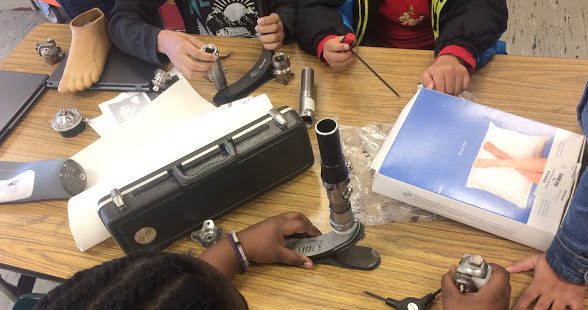 The students were excited and curious to see how prosthetic devices operate.